Welcome to Olive the Lake, a family owned and operated cottage resort and fishing lodge in Marten River, Ontario, Canada. We are a young and motivated family eager to make your stay a memorable one. This is our dream and we want to share it with you. Olive the Lake is one of the prettiest properties in northern Ontario. Located just 4.5 hours from Toronto, and situated on a private lake, come and cherish a northern Ontario fishing lodge and cottage experience. Sit back, relax and enjoy the peace and quiet you deserve. We have worked very hard to create a place that feels like home with the added bonus of being on the lake. Enjoy the lake in your front yard, catch some great fish, and sleep in a really comfy Tempur-Pedic bed. Olive the Lake won two awards in 2014 and 2015 from Resorts and Lodges – Top 10 Cottage Rental and Top 10 Fishing Lodge. Now taking bookings for 2019. Book soon before the best dates are gone! 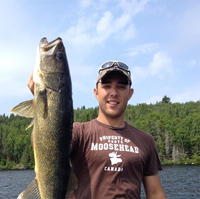 Olive the Lake offers the best in northern Ontario fishing. Olive Lake, our home lake, has walleye fishing, northern pike fishing, Smallmouth Bass and Perch fishing. 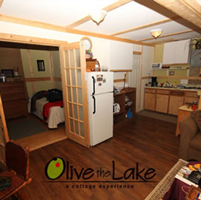 Olive the Lake cottages are tucked into the 5 acre wooded surroundings on the banks of Olive Lake in Marten River, Ontario. Come book a vacation in Northern Ontario today. 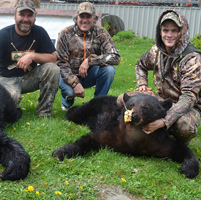 Bear Hunting in Ontario is a growing sport, a sport that was passed down from our grandfathers. With a proud tradition of wildlife management, & the sort of natural beauty that causes a tracker to stop in. “Looking for a great hunting experience in Northern Ontario. Great Hunting, Great fishing, Great place to visit. – Keith Beasley – Canada in the Rough. COME STAY WITH US DURING THE 2019 SEASON!! ALSO, CHECK OUT OUR “SELL OFF WEEKS” FOR GREAT SAVINGS ON LAST MINUTE BOOKINGS! !